OH YEAH. THINGS ARE ABOUT TO GET EXCITING. Have your design all ready to go? Click this really big button to get started! If you already have a decal designed and ready to be cut, purchase your decals and we’ll get a digital proof to you. You’ll still be able to request changes and make design alterations until you’re completely happy. We won’t begin production until you give us approval. Need a little more help with your design? Reach out below and let’s get started! To get started, simply send us a message with some details about your project and we’ll get back to you in about a day with a commitment-free design evaluation and price estimate. 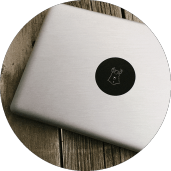 If you already have a design ready to go or if there’s a file that we’ll need to help create your decal, then make sure to upload that, too. Once we receive your message, we’ll get started on your project. If you supplied your own design, we’ll make sure it’s good to cut, but we’ll make tweaks if necessary. If you need some help with your design or if we need any additional files or information from you, we’ll reach out ASAP. Once we have your design ready to go, we’ll get back to you with a digital proof. After you approve the design and payment is processed, we’ll move on to step three, where the real magic happens. 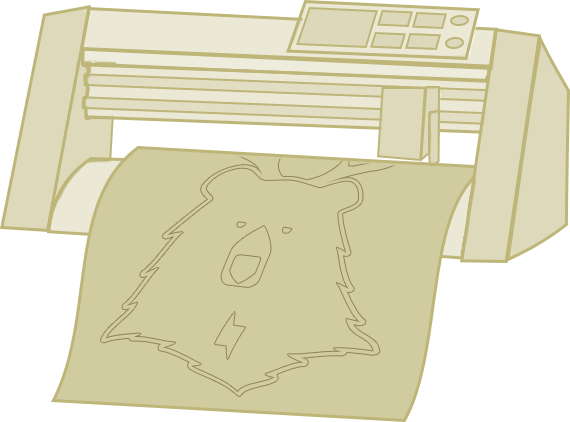 Once you approve the project, we’ll power up our vinyl cutting beast of a machine and create your decals! After your decals are cut, we’ll remove all of the excess vinyl by hand in a process called weeding. After weeding, we cover the decal with clear application tape then they’re in the mail to you. Most decals can be cut and shipped within five business days, but larger quantities or very complex designs (requiring additional time to weed) may take longer. No matter the project size, we’ll let you know the production timeline and when you can expect your decal(s) to ship during step two. If you have a design or file we'll need, attach it here. If you already have your design ready to go, click here for more details. If you need some help with design or have some special requests, keep reading about our ultra-easy, 3-step process. Step 1: Contact // Reach out and let’s get started. Reach out to us with your design or project via the form above. If you have a design already made or have a file, such as logo, that we’ll need to create your decal, then make sure to upload that. We’ll check out your message and get back to you within one business day. Yeah, step one is that easy. Step 2: Create // We’ll get your design ready to cut. As soon as we receive your message, we’ll begin working on your project. If you supplied your own design, we’ll make any little tweaks necessary to get it ready to be sent to the beast, but if you need a little more help or we need some more information or files, we’ll reach out with details. Once we’ve got your design nailed down, we’ll get back to you with a digital proof of your design, noncommittal price estimates, and what you can expect for a production timeline. Most projects can be completed within a few days, but if we have a longer queue, it might take a little longer. Once you approve the design and payment is processed, we’ll move over to step three, where the real magic happens. Step 3: Cut // We’ll turn your design into an amazing decal. 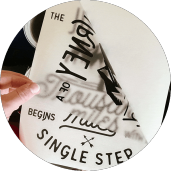 With the design approved, details such as color and quantity are determined, and is payment processed, we’ll power up our vinyl cutting beast of a machine and turn your design into reality! Once your decal is cut, we’ll remove all of the excess decal in a process called weeding. After weeding, we’ll cover the decal with a sheet of clear application tape so that it’ll be easy to install. After the decal is ready to go, we’ll get it packaged up with some easy-to-follow installation instructions and into the mail on its way to you. Getting your project cut and into the mail usually takes about a day or so depending on the design size and quantity, but we’ll make sure to give you a good time estimate before starting. If you need to be pushed to the front of the line or to make sure that we hit a specific deadline, rush production is available. 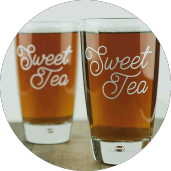 Prices are determined based on the decal size and quantity, so each project will be a little different; however, if you jump over to the custom decal product page, you can play around with different sizes and quantities to get a good idea of our prices. We do not have a minimum order quantity. No matter if you only need one decal or 10,000, we have you covered. The only thing to keep in mind is that we do offer bulk pricing to orders of larger quantities. When it comes to minimum decal dimensions, we don’t have a minimum per say; however, the complexity of your design may require a minimum dimensional size. If you just need circles cut, then we can go down to about 1/12 inch, but if you need some text cut, we may have to increase the minimum dimensions slightly to make sure it can be cut cleanly. Most orders are shipped within 3-5 business days, though if we’re backed up, it might take a little longer. If we anticipate any delays, we’ll make sure to announce them. Just let us know what deadline you’re working with and we’ll do our best to accommodate. What shipping method(s) do you use? First Class (3-5 business days) is included for FREE with decal orders over $50 and is good for smaller orders when the longest edge doesn’t exceed 11 inches. Priority (1-3 business days) is great when you need the decals a little faster than first class, and is required when any dimension of the decal exceeds 11 inches. We include FREE shipping on all U.S. orders! If you have any special shipping requests, just let us know and we’ll do our best to accommodate! First Class Mail International (1-6 weeks) Takes the longest, but is the most affordable and still very dependable. Most First class packages to Canada, Australia, or the United Kingdom arrive within a week or two, with any hold-ups usually being the result of customs delays. Total weight can’t exceed 4lbs (that would be a lot of decals!) and if the total value can’t exceed $400 USD. (If it does, we’ll simply break it into multiple packages.) Tracking is sometimes available depending on the shipping destination. Tracking will always be provided when it’s available. We charge a flat shipping rate of $14.99 for all international orders. It is our policy to include the actual product value and mark all orders as merchandise. It is the buyers responsibility to pay all related taxes, duties, and import charges, if any. Short on cash? Reach out to us with what you’re interested in and have to offer and we’ll see about doing a value=value trade. Really. Unless otherwise agreed upon, it is our policy that production does not begin until payment is made in full. Color: single color (preferably black) without a background. For more details about our design requirements, check out our Design Specifications page. Make sure the design looks good at the size it’ll be cut. Small text won’t be very legible on small decals. Design the decal at the final size it’ll be cut at. If any part of your decal design is smaller or thinner than 1/16 inch, there might be some challenges with cutting. Remember that the final design is going to be a single color without any shading or gradients. If your initial design has multiple colors, make sure the final image still looks good when it’s flattened and a single color. Keep your edges smooth! If your edges are jagged, your final decal be, too! Make sure to zoom in to 100% to double check the smoothness if your edges. If they aren’t smooth, sharpen them up! This type of issue is common when smaller, rasterized images are made significantly larger. We’re happy to answer your design questions to help get your decal looking as great as possible. We’ll make little tweaks to your design if necessary to get it ready to be cut; however, if you need more in-depth help, we also offer design services. I need help with my design. Do you offer design services? If you supply us with a premade design, we’ll take care of any little tweaks necessary to prepare it for cutting; however, if you require more than a few tweaks or need a custom design created from start-to-finish, we offer design services for a project-dependent fee, though it’s not uncommon for us to offer free design services with minimum decal order quantities – which is sometimes only one decal! If your premade design needs more than a few tweaks and you’d prefer to take care of them yourself, then we’ll simply let you know the changes that need to be made and you can send it back to us whenever you’re ready for no charge. Let us know what you have in mind and we’ll provide an estimate before getting started. What colors of vinyl are available? We keep a regular stock of quite a few different colors; however, we have access to many more and can get them if necessary. While we can’t guarantee exact color matches, we’ll do our best to find the closest alternative. If you have a specific color request or requirement, just let us know and we’ll do our best to accommodate! Can my decal have multiple colors? No. Yes. Well. . . sorta. Our decals are made from single-color solid sheets of adhesive vinyl, so gradients, shading, and multiple colors aren’t really possible on the same sheet. However, we can cut multiple decals and layer them together, creating a multi-colored final product. Since we’re actually creating multiple decals, then layering them together, there is an additional charge; however, having multiple colors can really set your design apart. Just let us know what you have in mind and we’ll take it from there. A vinyl decal, sometimes referred to as a transfer sticker, is a precisely cut piece adhesive-backed vinyl that has tons of popular uses. Vinyl decals can be commonly seen on vehicles such as race car sponsor signage through custom designs on regular car windows. They are also popular for labeling purposes, such as names on lunch boxes, cases, or water bottles. You’ll even likely come across vinyl decals when you read the open-close hours of your favorite store or restaurant. One of the more popular modern uses for vinyl decals is wall decor for house and apartment living. Our matte vinyl is perfect for walls as it can be easily removed years down the road without damaging walls nor leaving residue! Vinyl decals are popular alternatives to standard stickers when it comes to quality and longevity. Why do vinyl decals cost more than regular stickers? Whereas regular stickers commonly consist of a white printed paper stock with an adhesive backing, vinyl decals are made from a solid sheet of vinyl. The design of a sticker is only skin-deep while the design of a decal goes through the entire piece. Since vinyl decals are made from a solid plastic-like material, they’re extremely resistant to the elements – which is why decals are used on boats in the ocean instead of standard stickers. Decals also do not fade over time like regular stickers. Vinyl decals require more attention to complete than regular stickers. When regular stickers are printed and cut, they can be peeled and placed by hand. 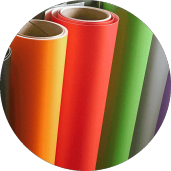 When vinyl decals are cut, the excess vinyl must be removed by hand in a process called weeding, then a layer of transfer tape is placed on top of the vinyl which is used during final installation. Lay the decal flat and swipe with a credit card, squeegee, our included bubble remover, or even just the first pressure of your meaty paws to remove all bubbles, if any, from between the application tape and the decal. Clean the surface you’re going to apply the decal with a damp cloth. Don’t use surface cleaners such as Windex as they can leave films which may prevent your decal from adhering properly. Slowly peel the white (or blue if the vinyl is white) backing material away from the decal, making sure that the decal remains on the clear application tape. If any part of the decal remains on the backing paper, replace the backing paper and repeat this step. Gently lower the decal onto the surface, then firmly, but smoothly, swipe across the surface to remove all of the bubbles and make sure that the decal has fully adhered. Slowly peel away the application tape, making sure that the decal separates from the application and remains on the surface. If any piece is being stubborn, gently lower the application tape back down, apply some pressure over that area, then repeat this step as necessary. Use making tape and hang the decal in the exact spot that you’d like it to be applied. Start from the top and slowly peel the white (or blue if the vinyl is white) backing material away from the decal, making sure that the decal remains on the clear application tape. If any part of the decal remains on the backing paper, replace the backing paper and repeat this step. After this step, your application tape should still be hanging on the wall by the masking tape. Gently press the decal onto the surface, then firmly, but smoothly, swipe across the surface to remove all of the bubbles and make sure that the decal has fully adhered. Hold the sides of the decal, bowing it slightly in the center. Starting with the center, gently lower the decal onto the surface, being careful to let any ripple or bubbles form. Once the decal is applied, firmly, but smoothly, swipe across the surface to remove all of the bubbles and make sure that the decal has fully adhered. Are there any limitations to vinyl cut decals? Our decals are cut from a sheet of one-color solid vinyl, so your design will be one single color. If you require multiple colors, we can cut multiple decals and layer them together. So I guess this make this more of a sorta-lmiitation. Small elements or really thin lines might present some challenges when cutting. If we feel that any elements of your design might not cut as cleanly as we’d like, we’ll let you know and work with you to get your design ready to go. We offer wholesale accounts to registered business for resale purposes. Prices and minimum quantities are determined on a case-by-case basis. If you have a project in mind or want to see about carrying any of our ready-to-ship designs, reach out any time! We offer custom retail packaging including bagged decals with custom printed hang-tags through custom designed large decal tubes. Minimum order quantities will apply and pricing is determined on a project-to-project basis. Whether you have a ready-made design or just want to discuss options, reach out today and we’ll get started! We can offer margins starting at 50%. Customers can purchase from participant or online with free U.S. shipping. Custom designs, such as your organization logo, provide longstanding exposure. Designs can be customized for each participant – great for sports teams! Decals can be mailed directly to customers or they can be bulk delivered for distribution by your organization. Decal sales are not seasonal. Additional decals can be purchased for year-around sale. Reach out to us today for more details and to get started!